Ocala Eye was recently featured in Ocala Style magazine, a publication which celebrates the Ocala, Florida lifestyle with such topics as arts and entertainment, fine dining, home and garden, real estate, and more! 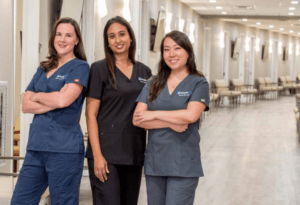 The feature article titled “The Women of Eye Surgery,” describes how Ocala Eye doctors Hina Ahmed, M.D., Sarah Kim, D.O., and Jodie Armstrong, M.D., F.A.C.S., are blazing the path to the future of eye care with the opening of the brand-new, state-of-the-art office in Market Street at Heath Brook. In their own unique ways, Dr. Ahmed, Dr. Kim, and Dr. Armstrong are revolutionizing the face of ophthalmology practices and bringing some of the most sought-after eye diagnostics and procedures to the Ocala community. To read all about it click here.